Conventional web browsing is risky. The browser is the only business application that we permit to run unseen third party code inside the firewall. If that code is malicious, then the business is at risk. So far, we’ve addressed the problem by limiting access to risky applications such as social media and webmail. But these restrictions can impact efficiency, productivity and morale. And there's still a risk of infection. But there is an alternative. When we make the quick and easy switch to isolated browsing, we move all browsing activity into a private, secure and anonymous environment in the cloud. From this point forward, it is simply impossible for anyone to bring malware, such as ransomware, into the business with their browser. No business can operate without the web. 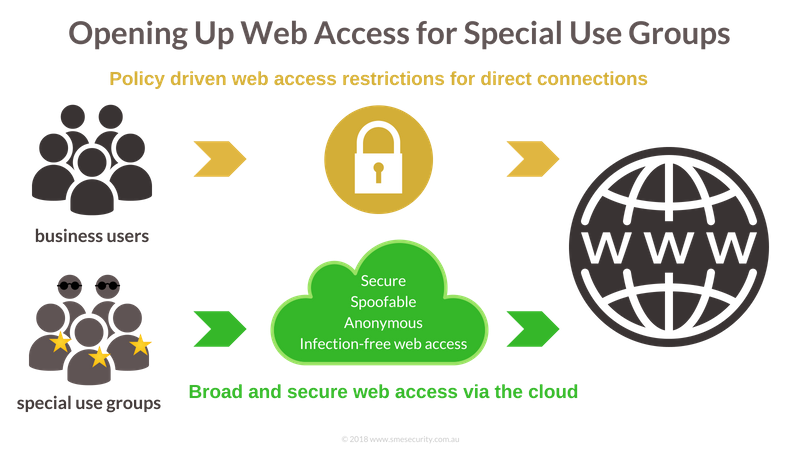 By switching to isolated browsing, we have a quick, easy and cost-effective way to give the business broad access to the web that is simple to use and totally safe, secure and anonymous. The browser is the Achilles heel of modern business. Don't let it be your downfall. There are only two ways to ensure that malware never enters the business from the web. Click to start your free trial. In a conventional browsing set up, the web browser is installed locally. This is risky because, as we browse, potentially dangerous web content is downloaded to our device and executed locally. If any of this content is malicious, we could wind up infected the business with malware. When we isolate the browser, we move all browsing activity away from the business. Web content is now downloaded to, and executed within, a secure container in the cloud. No potentially dangerous web content ever reaches our devices and so the business remains secure. We all need access to the web, but some need it more than others. Business analysts and researchers (such as anti-money laundering (AML) analysts and infosec researchers) need broad access to the web to be effective. By switching to isolated browsing, analysts and researchers can reach into all corners of the web safe in the knowledge that their activity is totally anonymous and their day job won’t ever bring malware into the business. Service providers are being required to match the security provisions of their clients, but this can be a big ask for small businesses. By switching to isolated browsing, service providers can work with client documents safe in the knowledge that client confidentiality and data can never be compromised as a result of browsing the web. Wouldn’t it be great if you could guarantee that your clients were transacting with you from a secure, malware-free environment? Now you can. Instead of sending clients directly to your secure website, you send them to your website from within a secure isolated browser session. Your clients won’t be able to tell the difference and you can relax knowing that their transaction is 100% private, safe and secure. Mixing business and pleasure is fun for James Bond but not so good when it comes to web access. By moving all personal browsing activity away from the network and into the cloud, we provide clear delineation between the two and ensure that personal browsing activities can never disrupt or damage the business. Thank you for your enquiry regarding Isolated Browsing. We’ll be in touch as soon as possible.